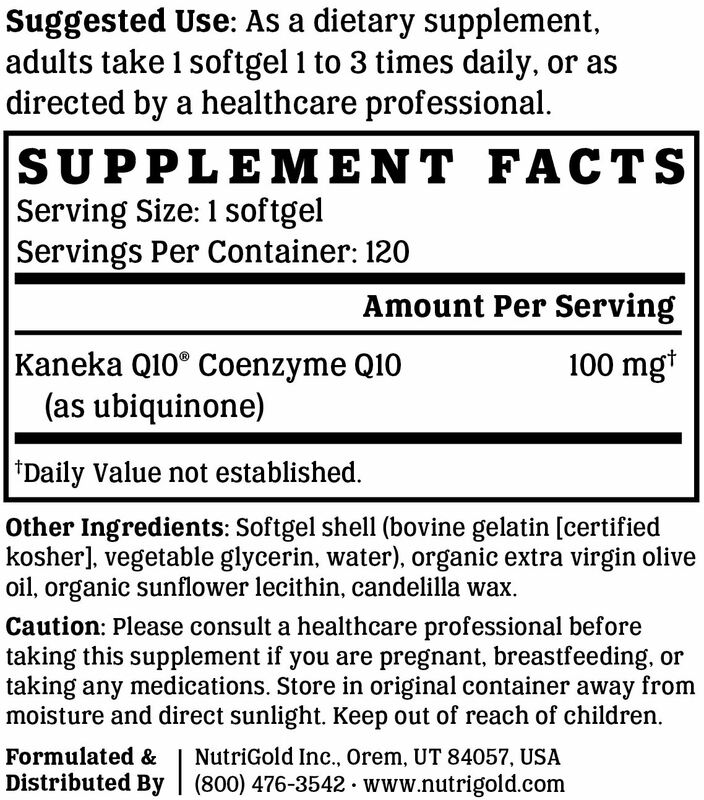 CoQ10 Gold features KanekaQ10, the purest and most researched CoQ10 ingredient in the world. CoQ10 Gold is manufactured in the USA to industry-defining quality standards and is verified by independent third-party labs to meet identity, purity, and potency label claims. CoQ10 is a powerful, fat-soluble, vitamin-like substance found naturally in all forms of animal life. It is biosynthesized in the membranes of cells in humans and is vital in the production of energy. It is a power plant of the body that is found in most cells, with especially high concentrations in the heart, the organ that requires high levels of energy for normal operation. As an antioxidant, CoQ10 helps protect proteins and mitochondrial DNA from oxidative damage and, consequently, supports a healthy heart, brain, and joints. Although the body can typically make the CoQ10 it needs for optimal health, several factors including, but not limited to, cigarette smoking, aging, use of certain medications (e.g. statins), and some disease states can affect CoQ10 levels in the body, making supplementation necessary. 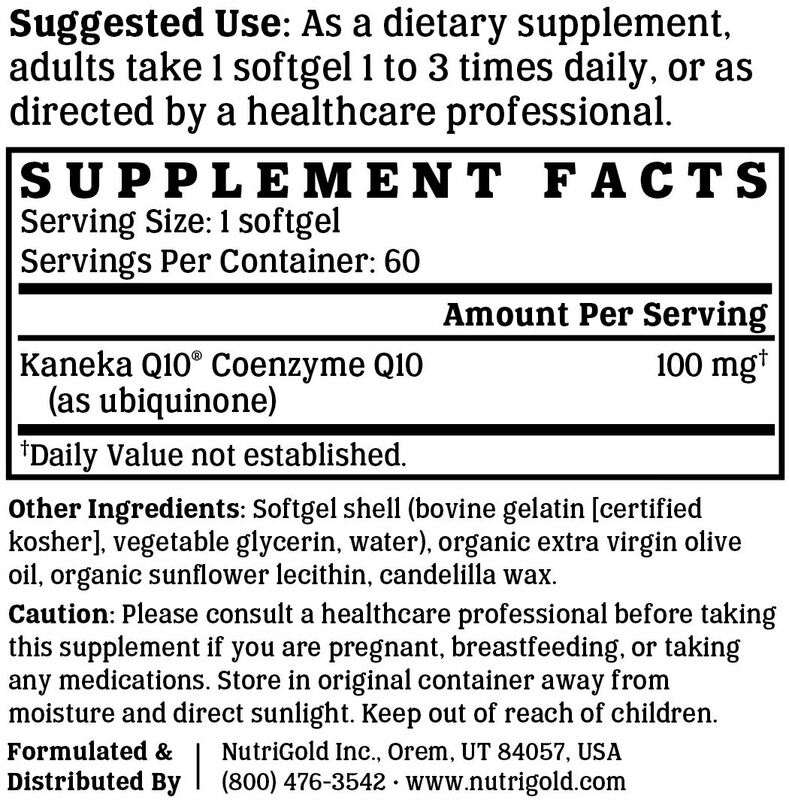 The Kaneka Q10 in CoQ10 Gold is the purest and most researched CoQ10 ingredient in the world. It is bioidentical to the CoQ10 produced naturally in the body and has, over the last thirty years, been used in the vast majority of the clinical trials done on CoQ10. KanekaQ10 is yeast-fermented and does not contain the impurities that are commonly present in CoQ10 produced from tobacco leaves. We like to make supplements that can be enjoyed by everyone. That's why our products are always compliant with the best practices for avoiding allergens and minimizing cross-contamination. CoQ10 Gold is free of soy, gluten, egg, milk, peanut, shellfish, and corn allergens. Consistent with our guiding principle to “do no harm,” CoQ10 Gold is manufactured without the use of additives or preservatives. It contains absolutely NO contaminants, pesticides, herbicides, harmful additives, residual solvents, magnesium stearate, or hexanes. Like all NutriGold products, CoQ10 Gold is subject to over 140 purity and potency assays by independent, third-party labs to ensure that the product meets or exceeds its claims. So, you can be certain that what's on the label is what's in the bottle. Nothing more, nothing less.